Looking northward from the highest flyover within the Interstate 95 and Future Interstate 295 directional-cloverleaf interchange near Wade. Photo taken 05/30/07. 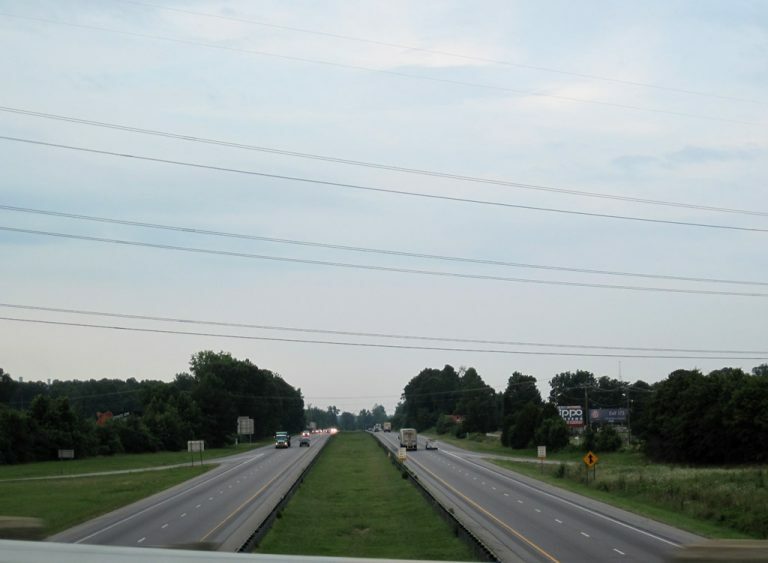 Interstate 95 through eastern North Carolina is a rural freeway traveling through the eastern third of the state. Primarily avoiding major population centers, with the exception of Lumberton, I-95 generally serves through traffic between Florida and the Northeastern U.S. With a metropolitan area population of nearly 400,000, Fayetteville is the largest city along the corridor. Other regional service centers along I-95 include Wilson, Rocky Mount and Roanoke Rapids. Excepting stretches with auxiliary lanes, all 181 miles within North Carolina remain at just four lanes. Because the majority of traffic using I-95 in North Carolina just passes through the state, North Carolina officials discussed the possibility of tolling the route to pay for improvements such as widening and modernization. An early 2000s proposal outlined adding six toll plazas statewide along the freeway, each levying tolls of $3.00 on passenger vehicles. It did not pass legislation. Additional proposals for tolling I-95 arose as well in 2006. Four lanes of Interstate 95 travel south of the North Carolina 46 overpass near the Roanoke River in southern Northampton County. Photo taken 06/25/10. Subsequent proposals in 2011-12 involved tolling Interstate 95 in North Carolina with rates as high as $20 for using the entire freeway. Increased opposition, including the No Tolls on I-95 coalition formed, with billboards and banners posted along the I-95 corridor against tolling. Exit 70 - Bud Hawkins Road - geometric improvements to the parclo B2 interchange. Exit 71 - Long Branch Road - eliminate frontage roads and rebuild the diamond interchange into a wider footprint. Exit 72 - Spring Branch Road - realign frontage roads away from I-95 to accommodate a wider diamond interchange. Exit 73 - U.S. 421 - smooth the curve of the freeway mainline and geometry of all ramps at the diamond interchange. Work also will eliminate the at-grade intersections with Simpson Avenue and Broad Street on the north side ramps. Exit 73 - Jonesboro Road - greatly expand the footprint of the diamond interchange and realign or truncate frontage roads. Exit 77 - Hodges Chapel Road - improve ramp geometry at the diamond interchange and realign or eliminate frontage roads so that they no longer tie into the ramps with I-95. A ten mile portion of Interstate 95 opened to traffic between North Carolina 50 at Benson and the Cumberland County line south of Dunn on October 21, 1958.2 This portion was part of a U.S. 301 expressway extending north from Eastover to Kenly that would be grandfathered into the Interstate system. 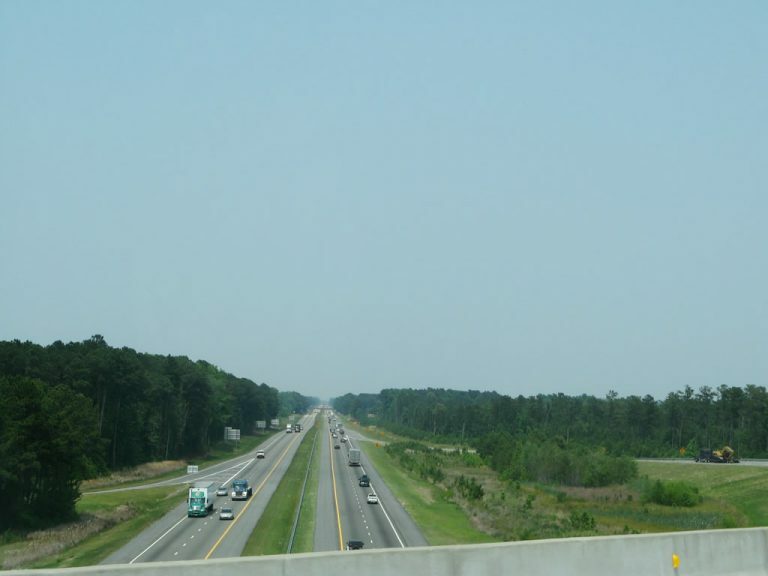 Another section of U.S. 301 directly added to I-95 was the Lumberton bypass. Wade-Stedman Road east to U.S. 13 south acts as an alternate route to Interstate 95 south in lieu of the entrance ramp at Exit 61. Wade-Stedman Road ends at U.S. 13, 3.5 miles east of I-95, U.S. 301, and N.C. 295 (Exit 58). Photo taken 06/25/05. Anderson Street west at the southbound loop ramp to Interstate 95 at Selma. Smithfield is served by the next three exits. Photo taken 06/24/10. Entering the folded diamond interchange with Interstate 95 on Anderson Street east. Anderson Street becomes Pine Level Selma Road east of the freeway. Photo taken 06/24/10. Interstate 95 passes over both Anderson Street and the adjacent Norfolk Southern Railroad at Exit 98. Photo taken 06/24/10. Interstate 95 north leaves Selma for a nine mile drive to Kenly, where U.S. 301 branches northeast to Wilson. Photo taken 06/24/10. North Carolina 46 ventures three miles southeast from Gaston to meet Interstate 95 at a diamond interchange (Exit 176). Long Farm Road spurs south from N.C. 46, providing access to the southbound on-ramp. I-95 heads south three miles from here to Roanoke Rapids. Photo taken 06/25/10. Spanning Interstate 95, North Carolina 46 approaches the northbound on-ramp to Emporia, Petersburg and Richmond, Virginia. Photo taken 06/25/10. Traffic to Interstate 95 north leaves N.C. 46 east. I-95 exits the state in 5.8 miles as North Carolina 46 continues 3.3 miles to end at U.S. 301 in Garysburg. Photo taken 06/25/10. "Six outdated I-95 interchanges will be rebuilt; see what NCDOT has in mind." The News&Observer (Raleigh, NC), October 20, 2017. "1958: Ten-mile stretch of I-95 opens." Fayetteville Observer, October 18, 2008.